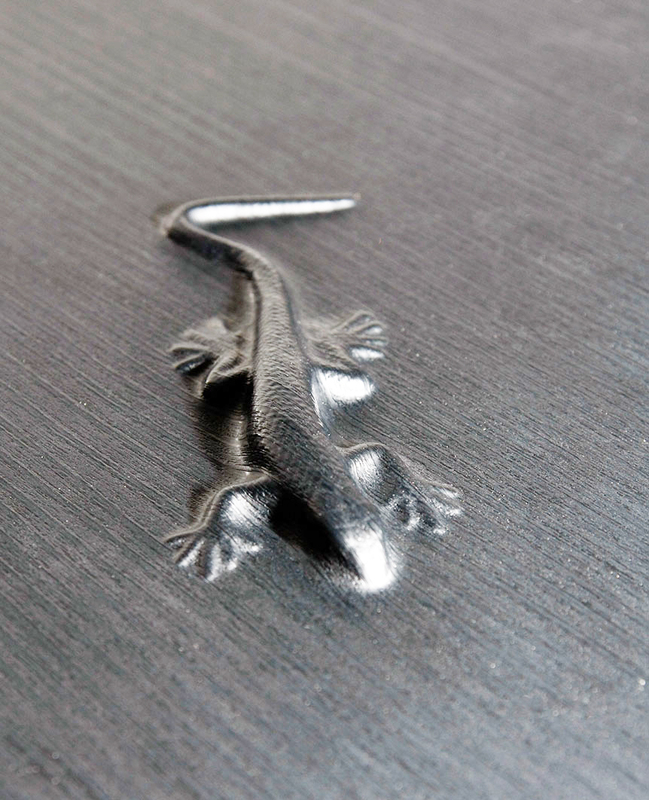 3D laminates are thermoplastic overlays on carved, smooth substrates. mATERIAL SUPPLIER: rENOLIT. Photo by Kenn busch photography. all rights reserved. Specified on components for furniture or architectural wall panels, 3D Laminates are thin decorative thermoplastic overlays, laminated to carved or shaped MDF panels. They are unique in that they can be pressed to panels with 3D details machined into their faces and edges (hence the name! ), as well as unconventionally shaped panels and panel edges. 3DL’s ability to “self-edge” – wrap seamlessly around five of six panel edges as well as interior cut-outs – reduces processing steps and helps seal the panel core against moisture and bacteria. This ability also helps create “soft” edges that mimic shaped solid wood, stone, solid surface and machined metals. 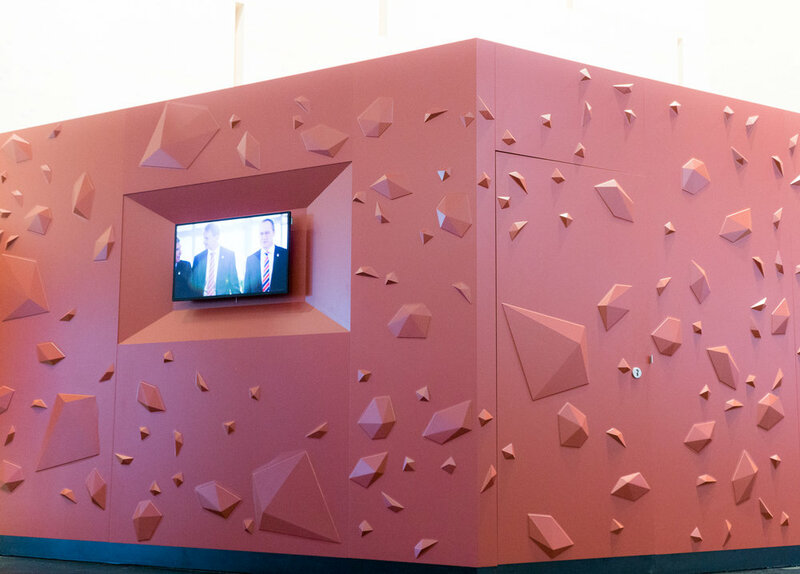 3DL panels are used in residential and commercial projects in applications that call for decorative panels with unusual shapes, deep three-dimensional surface details and soft edges. 3DL panels have seamless faces, making them waterproof easy to keep clean. 3DL components with hardwood or exotic wood designs save these species from harvest while offering higher durability and easier maintenance. The most common substrate used in 3DL panels is MDF, a better-than-carbon-neutral CARB2 compliant LEED-friendly material. + Where is 3DL Used? Commercial: Use of 3DL surfaces has grown in recent years as the office furniture industry has embraced nonstandard and organic shapes for worktops, and with the growing need for integrated cable management cutouts and channels. Its durability and cleanability make it a very good choice for healthcare, hospitality, education and retail. Target and Best Buy have specified 3DL materials for their transaction counters. Carved 3DL panels are commonly used in architectural feature walls in hotels, restaurants and other public spaces. Residential: Kitchen and bath cabinet doors and drawer fronts in 3DL are a durable alternative to solid wood and lacquered components. Also found in headboards, closet and storage systems, shelving and entertainment centers. 3DL materials are less prone to damage than woods, veneers, lacquered surfaces and solid surfaces. Finished 3DL components have seamless faces and edges, making them impervious to moisture and bacteria, and very unlikely to delaminate. Because the surfaces are thermoplastic, impact damage won’t crack 3DL faces. The amount of “denting” depends on the density of the substrate. Surface Visuals: 3DL overlays are available in solid colors, metallics, woodgrains and other designs, using printed rotogravure machines using water-based or solvent-based inks. Textures: Woodgrain, brushed aluminum and similar textures are applied to the overlay with embossing rolls. High gloss, matte and finger-proof super-matte textures are available. Shapes/Form: 3DL is unique in that it can be used to create intricately shaped and carved panels machined in MDF. Design Matches: 3DL producers publish guides to matches in complementary materials – TFL, HPL, decorative paper foils and edge treatments, as well as peel-and-stick materials. Edges: 3DL is “self-edging” – the fabrication process wraps the material around panel edges. 3DL overlays are manufactured in carefully controlled factories and delivered to components manufactures in sheet or roll form. PVC production requires less energy than PET production. Machined MDF parts are sprayed with a heat-activated water-based adhesive and staged at the press intake. The 3DL surface is laid over the parts and shuttled into the press. Once inside, the 3DL is drawn up to a heated surface above the parts bed to increase its pliability, then laminated to the parts by an inflatable membrane pressing from above, or by vacuum pressure pulling the material down from below in combination with positive pressure from above. 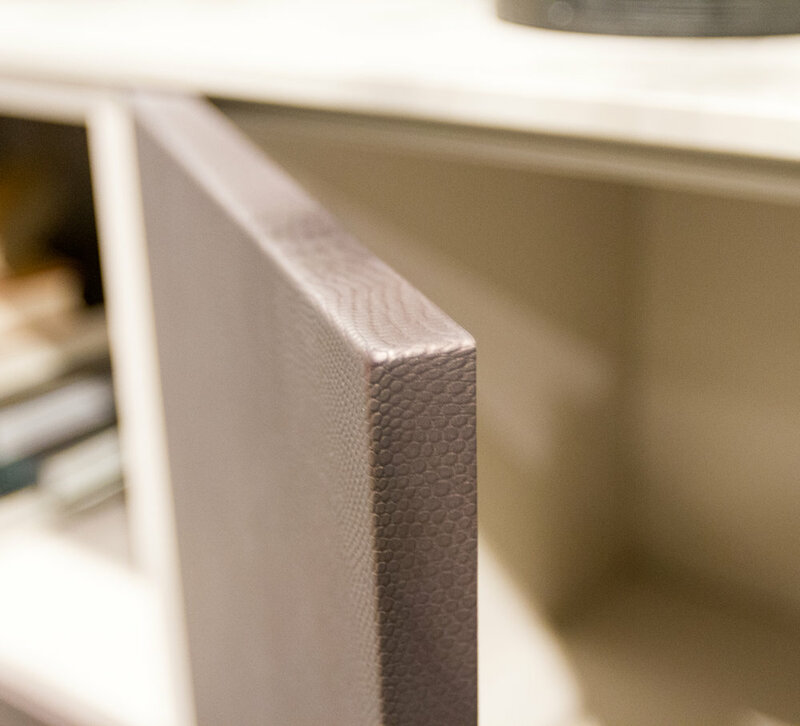 This process effectively bonds the surface to every detail machined into the MDF substrate, and creates a tight seam where the edges and back meet. After cooling, the overlay is trimmed at the back edges to finish the 3DL component. 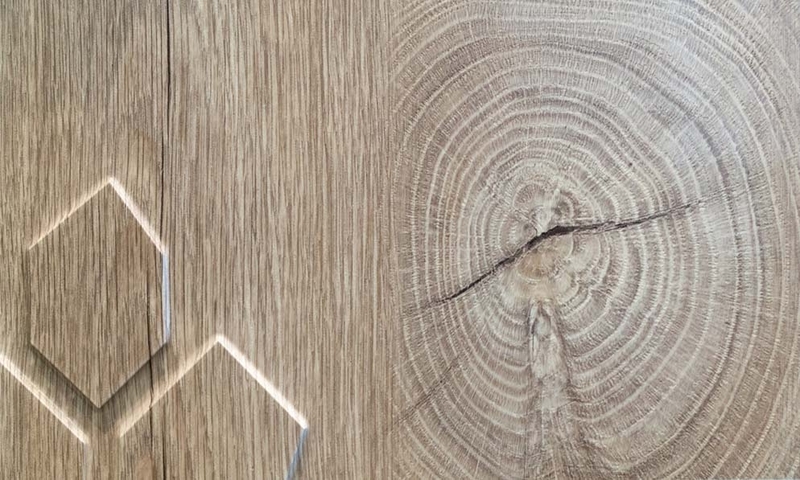 3DL components made in North America have MDF composite wood cores that have been found to be “better than carbon neutral” – utilizing wood fiber that would otherwise be landfilled or incinerated, and sequesters more carbon than is expended in the panel’s manufacture.